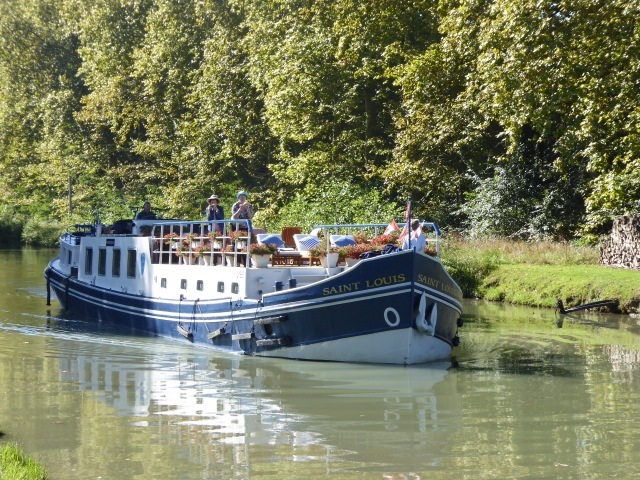 “We had the delightful chance to experience great weather and the wonderful scenery and hospitality of our hosts, Peter and Wendy Carrington on the deluxe barge Saint Louis in September of 2014. We had resisted booking conventional cruises or even larger river cruises because of the number of passengers and the resulting need for standardization of itineraries. When we learned about the Saint Louis we were attracted to the fact that it takes only six passengers and allows for considerable flexibility of itineraries and meals. All services are included in the fee. Every day included a few hours of gentle canal cruising and a guided tour of the local countryside. An eight passenger Mercedes van was used for the daily excursions as well as for picking passengers up at both ends of the cruise. Each day we were offered some suggestions for the excursions and we could opt to come or not or to modify it. Beth Hanson, our booking agent, contacted us some time before the cruise began, asking for any food allergies or preferences and conveyed this information to Peter, who accommodated all our requests if at all possible. This included preferences for drinks. The open bar was available at any time and every lunch and dinner was accompanied with two different local wines chosen specifically to compliment the dishes being served. It is hard to describe adequately the level of service Peter and Wendy provide. Wendy is a true artist in arranging beautiful place settings for every meal, including breakfasts. I think every meal had different linens and color schemes. Peter is a talented chef, who provided a wide range of fine French cuisine using local food items. Every day he made an early morning run to a different local boulangerie for fresh croissants and bread and some time each day he or Wendy shopped for fresh food. One afternoon he climbed a hill where he knew borage flowers grew that he used to decorate the evening dessert! Nothing was left to chance in creating the gourmet meals. Speaking of special service, my camera battery charger stopped working on the first day and I was afraid that I would not be able to take any more photographs, but Wendy offered to look for a universal charger that might work. She shopped for it while we were enjoying our daily cruising and would not even accept money to reimburse her expenses! That is what I call going above and beyond. Peter and Wendy had only recently taken over hosting the barge cruise, which they had been planning on doing but they had to move their date ahead due to health problems with Barbara, the wife of the former proprietor. I am sure they were on a steep learning curve that was accelerated when Minnis, their regular pilot and tour guide also suffered a health issue. Tim, an experienced barge pilot, was brought aboard and while there were a few minor glitches with learning the specifics of the Saint Louis, Peter and Wendy calmly managed to maintain the serenity of the cruise. They even had a French TV camera crew filming a documentary for a whole day. I am sure they were like the proverbial ducks, smoothly gliding along while paddling furiously under the surface, none of which was visible to the casual observer. They really seem to enjoy people and to providing the very best possible experience for their guests. While the price may be more than equivalent time spent on larger vessels, the value is exceptional for anyone who appreciates being treated to a slow paced glimpse of luxury in a beautiful part of France.